Poultney Rotary is one of 33,000 community based clubs found throughout the world as part of Rotary International and has been a part of the Poultney community for over ninety years. Rotary International began as a service organization of businessmen in 1905. Today every Rotary club, including Poultney, is made up of men and women from diverse professional backgrounds and experiences. This background and interest in volunteering helps establish connections, partnerships, and a variety of ways to serve. Rotary Service in Action can be seen in Poultney through support and partnership with our Rotary District. Working with the District 7870 District Matching Grant program, Poultney Rotary has been able to make contributions that provided items in the Poultney Library expansion. District grants also aided in providing backpacks and school supplies to students in Poultney and in 2019 will provide matching funds to support a lending library (literacy program) and the community pocket park on Main Street. In partnership with Rotary International Foundation funding, District 7870, District Governor Venu Rao, the Colonie-Guilderland NY Rotary Club with support from their District 7190, and a group of other clubs, Poultney Rotary will be a part of a Global Grant with the guidance from Pure Water for the World for the village of Trojes, Honduras. This Global Grant project will provide sustainable safe water for close to 1,600 residents. Rotarians from our town/area will be able to connect with Rotarians in Honduras ( Primary Contact: Rotary Club of Nueva Tegucigalpa) who are the link to this project and to the success of this program long-term. Our greatest endeavor is the service and contribution members make here in the Poultney region. The Poultney Rotary Club sponsors programs for youth/young adults (New Generation) at Poultney High School (Interact Club) and a Rotaract Club for community members/college students, meeting at Green Mountain College. Through its activities and committees Poultney Rotary provides community outreach and service projects. Other activities are fundraisers for the club that support the work of the club in the community. On March 23, Poultney Rotary will partner with the Stone Valley Arts Center for the second consecutive year to offer a Painted Sap Bucket Auction as part of Maplefest 2019. Our biggest fundraiser centers around activities on the last Saturday of September when the Chili Cook - Off is held. The 2019 edition of this event will be the 30th Annual Cook - Off. We meet most Thursdays, 7 am, at the Meeting House on Bentley Avenue. We welcome visitors and those interested in volunteering in Rotary service. Please consider joining us for a morning meeting or please speak to any member of the club regarding membership. Visit our Facebook page for additional information. 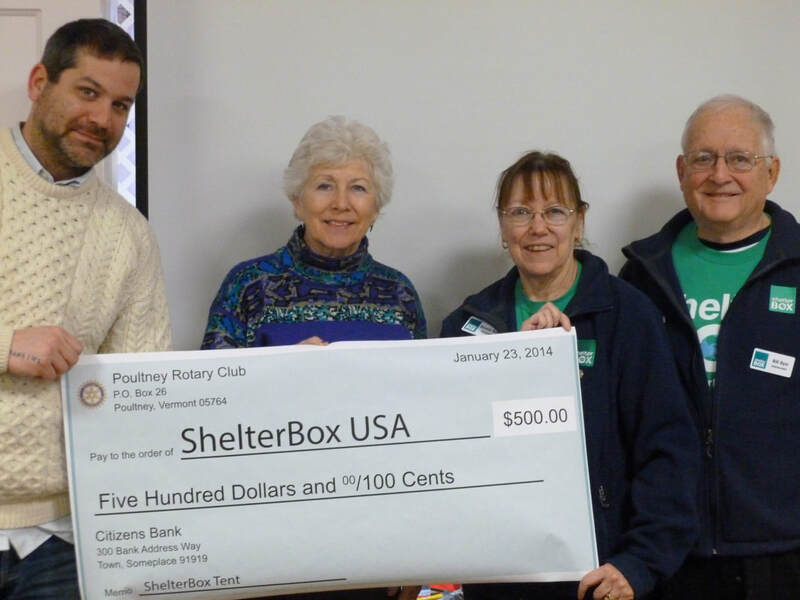 Check presented to Shelterbox Ambassadors Dennie and Bill Dyer by Treasurer John Van Hoesen. Josh the Otter, part of a Rotary water safety/literacy program, has his photo taken with students.